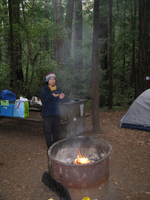 This past Friday night was Camping Experiment #2 at Butano State Park near Pescadero. I wanted to try out the tips that I’d gotten after Camping Experiment #1, plus just have a fun night out with my friend/coworker Jean. I left work early on Friday and took the longish route to Butano State Park. I stopped for lunch at Alice’s, where I parked next to three motorcycle cops from Salinas who were out for a joy ride. I took Hwy 84 over to the coast and rode south alongside the Pacific. Good times. Jean was already setting up camp when I arrived. Since she was car camping, she brought me her husband’s 3″ Thermarest. Talk about comfy! I felt like I was floating at the top of the tent. Too bad it packs up to the approximate size of all the rest of my gear put together. Jean also brought her Taj Mahal 4-person family tent, giving me a bit of size anxiety. One thing that really helped with the cold aspect was starting a campfire. Yay campfire! We drove into nearby Pescadero for cinnamon english muffins from Arcangeli’s and picked up two boxes of wood while we were there. Dinner was a mixed salad of spinach greens, fresh tomatoes, and a poppy seed salad dressing (provided by Jean and hauled in her Prius) plus JetBoil-cooked Jambalaya and ChiliMac (provided by me and hauled on my Beemer). I’m beginning to see why people like car camping. By the way, both the Jambalaya and ChiliMac were from Mary Jane’s Outpost and were very good. Two hippie thumbs up! During dinner, it started raining. 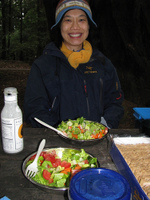 Thanks to the canopy of redwoods, though, the picnic table stayed completely dry. It was really relaxing and wonderful to sit by the fire, drinking beer and chatting, and listening to the rain pitterpatter down all around us. Nighttime was the real test of my camping experiments and this week, it went very well! I’d put all of my bike gear and the stuff sack bags underneath the cot when I set it up, and placed Jean’s monstrous Thermarest between the cot and my sleeping bag (which I’d also exchanged for a Marmot Women’s Teton 0F since last week, after talking to many campers). Just before crawling into the sleeping bag, I undressed and pushed my clothes into the foot of the sleeping bag. I put on silk long johns and my hat, and got into bed. Lo, I was even warm!! It was a miracle. Hooray! I woke up a few times in the night, but it was more due to “What’s that noise? Oh, rain on the tent.” than discomfort. I actually slept quite well. In the morning, I found that the outside of the foot of my sleeping bag was damp where it had brushed up against the tent wall. There was a bit of condensation on the inside of the tent, but nothing else was damp. Next time I’ll make sure to keep the sleeping bag away from the tent wall, though after hanging the bag up at home, it dried in less than an hour. Other than the condensation, the tent was completely waterproof. That was a good and unexpected experiment! 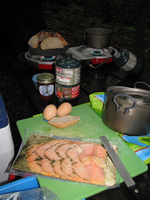 Jean and the car camping pulled through once again with a full breakfast spread of eggs, toast, and smoked salmon. Yessir, we were roughing it. There was no denying where we’d set up our tents! All in all, it was a great night. We had a lot of fun, and I stayed warm! I brought a small digital thermometer with, just for fun, and it recorded a minimum temperature of 47F in the tent overnight. So that’s not bad at all. I think that keeping the tent zipped up and the fly down (instead of staking it out to create vestibules…that part of the fly is also over the large mesh areas of the tent) really helped keep the temperature up. For what it’s worth, I also really liked Butano State Park. The campsites were clean and not one right on top of each other. It may be crowded in peak season, but it was perfect when we were there. The rangers we met were also very friendly and waved with a big smile whenever they drove by. I’ll be going back! Yay! That sounds like fun! Is Jean coming this Friday, too? I go camping once every month or two, and staying warm has been a problem during the winter months. I have a very light fleece sleeping blanket that I will put inside a larger sleeping blanket, and if I’m still cold, I will wear long-johns and tomorrow’s clothes as well. If I still can’t stand it, I use a 12v electric blanket hooked up to a deep-cycle battery that I always bring to recharge power tools and such. (18v chainsaw, drills, etc.) I camp and bring all my supplies (And my Serow) with my Subaru, which is reduced from my roomies and my brother which have big SUVs filled with supplies. I cheat as well, and keep all of my camping gear loaded up in my Subaru. I never take it out, because I never drive my Subaru unless I’m camping. I hate condensation! The wetter of sleeping bags and clothes. Glad experiment #2 went well! I found an off brand Thermarest clone at an Army/Navy store that rolls down to about 2.5-3 inches. I think Thermarest has different sizes and thickness too. Alot of times having that little bit of padding and insulation makes all the difference. A good nights sleep makes for a better day of riding. I wonder if your cot is allowing the cold air to surround you? Ever notice how animals make a little “bowl” in the ground to sleep in when it’s cold? I could never get my thermarest back into its stuff sack until I came up with this procedure: First, roll up your thermarest with the valve open, then close the valve, unroll it and re-roll it. When it is almost rolled up, open the valve and let the rest of the air out, the re-close the valve as you finish rolling it up. The thinnest thermarest can be rolled up into a very small package, will still keep you warm and is very comfy with the right air pressure. woohoo camping in the rain! I live in Washington and more often than not get rained on when camping. Still fun! The rolling things up twice that Steve brought up works well for sleeping bags and tents too. My frinds are often surprised that I can fit so much stuff on my bike. every little bit helps!